CAMP HILL, Pa. (WHTM) – A Camp Hill man says he had a choice: die or break the law. He decided to risk arrest by illegally using medical marijuana. He shared his story with ABC27 three months ago. It went viral and was shared over 10,000 times on Facebook. ABC27 hid his identity to protect him and his family. Now, they are coming out of the shadows with an update on his health and a message for lawmakers. In 2002 a man was diagnosed with a disease that just by hearing its name makes your hair stand – he was diagnosed with a benign brain tumor that was 5.5cm big. He underwent surgery in Sofia, Bulgaria, which went excellent. But, it wasn’t over. After two years the tumor came back with the same size and it turned out that it was actually of a recurrent type or better said it was a metastatic cancer. He was suggested to have another surgery, this time a laser one so he accepted. Again, the tumor was successfully removed, but there were consequences; his left arm and leg ended paralyzed. Colorectal cancer is the second most common cancer diagnosis among females and the third most common in men worldwide. Despite technological and pharmaceutical advancements in diagnostic and therapeutic programs,colorectal cancer has a 5-year survival rate of only 54-65%. CANCER patient Mike Cutler yesterday hailed cannabis as a miracle cure for the disease after his symptoms vanished when he began taking the drug. Mike, 63, was diagnosed with liver cancer in 2009 and was given a transplant. But in late 2012 he learned cancer had attacked the replacement organ. Today you’ll read about a very interesting case of a teenager who cured her brain tumor using cannabis oil. This is noteworthy for many reasons. Her tumor cell type is novel and considered a low-grade malignancy. But low-grade cannot describe how deadly these tumors can be. They can continuously grow until brain function is sufficiently compromised to cause death. Her name is Taylor Rehmeyer. Taylor is now (2015) fifteen years old. When she was only six she was diagnosed with a rare brain tumor. The tumor is called a ganglioglioma. It’s commonly found in the temporal lobes of children first presenting with temporal lobe epilepsy. Figure above: cerebellar ganglioglioma. 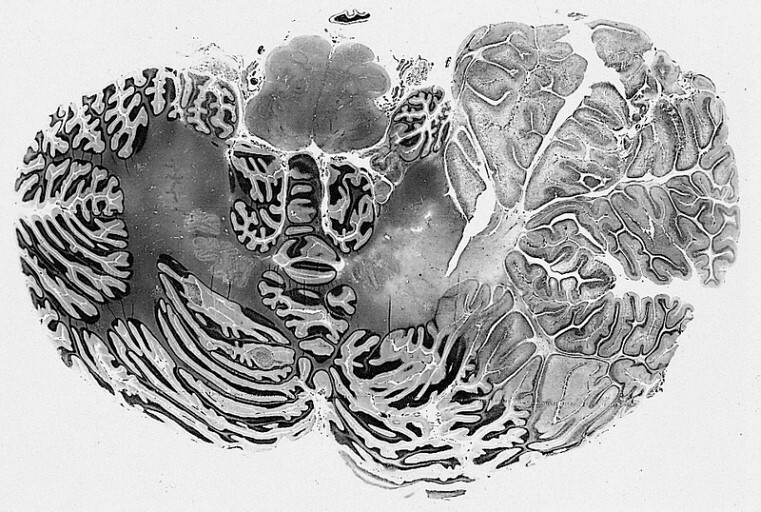 Cross section through the cerebellum. Top right of image is the tumor with some involvement on the opposite side. 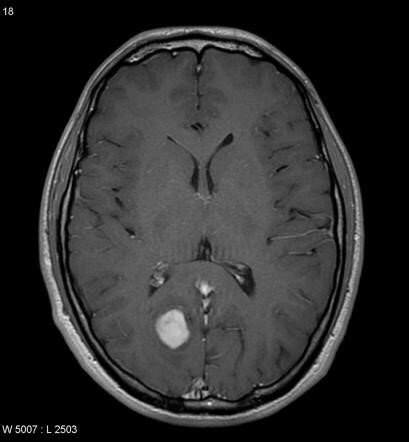 Gangliogliomas are uncommon low grade (WHO Grade I or II) CNS tumors. They are, however, the most frequent of the neuronal-glial CNS neoplasms. Epilepsy, seizure activity, is a common clinical presentation since this tumor has a typical occurrence in the temporal lobes, although they have been described in all parts of the central nervous system. Children and young patients are usually affected, and no gender predominance is recognized. It accounts for around 2% …of all primary intracranial tumors, and up to 10% of primary cerebral tumors in children. The most common presentation is with temporal lobe epilepsy, presumably due to the temporal lobes being a favored location. It is the grade of the glial component that determines biological behavior. Dedifferentiation into high grade tumors does occasionally occur, and it is usually the glial component (into a glioblastoma multiform or GBM). Only rarely is it the neuronal component (into a neuroblastoma). They are closely related to gangliocytomas, which contain essentially only mature neural ganglion cells, and ganglioneurocytoma which in addition have small mature neoplastic neurons. 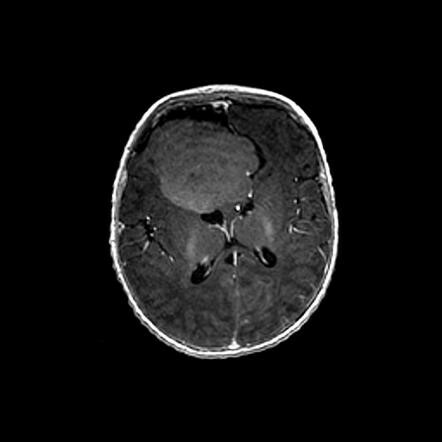 Image of a ganglioglioma (white region). The above image shows how large these tumors can become. Literally crowding out other brain structures in this case. Tumor is at 11 o’clock. The very best solution for cure is surgery if at all possible. Local resection is the treatment of choice and determines prognosis. In the brain where a reasonable resection margin can be achieved, prognosis is good with at least an 80% five-year survival. In the spinal cord where this is not possible without devastating deficits local recurrence is very common. If only incomplete resection is achievable, or tumor recurrence occurs then radiotherapy may be of some benefit but will not cure it. Although considered a low-grade malignancy this tumor is anything but benign. It can continue to grow and obliterate brain structures and eventually cause death. Most importantly is the ability of the surgeon to remove as much tumor as possible to prevent recurrence. In the brain that occasionally can be done. Case continued: When Taylor was only six years old on All Hallows Eve, she suddenly and quite unexpectedly lost consciousness and fell out of her chair. From there she fell into a deep sleep for the rest of the evening. By the following morning Taylor began vomiting and had her first seizure. Subsequently her doctors found a brain tumor of unknown type the size of a golf ball. She was scheduled for surgery (2006) which went well. At least technically. The surgery did affect her brain causing her to slow down in certain areas such as learning new concepts. And her peers never let her forget it by referring to her as “tumor girl,” stupid and retarded were terms commonly thrown about. Finally, after her brain was allowed to recover she gradually could feel everything getting back to normal. Of course, that’s when the tumor returned as well. That was October, 2010. She had her second brain surgery in October which appeared to have gone well. Then quite unexpectedly the tumor again resurfaced in 2011 with more novel and aggressive tumor features. …it was larger and more intertwined with her brain tissue than before. Between November and April, it doubled in size. Surgery was no longer an option because too much of her brain would have to be removed. At this point she was ready to give in. No more surgery, no more radiation. She made a deal to receive a new form of treatment called proton beam therapy. In September 2012 she was scheduled for proton therapy. Taylor, 13, also is a pioneer. Earlier this summer, she became Roberts’ first patient with a ganglioglioma — a rare form of brain tumor — to undergo proton beam therapy. The procedure shoots a precise beam of protons at cancer cells, sparing surrounding tissue from the lethal effects of X-ray radiation. Taylor relates how the painful wire mask on her face, needed to keep her immobile, was cutting into her face. This mask is bolted to the table prior to initiating the proton gun. She will need to endure a ten-week trial of proton therapy. Then after that, months later, they would evaluate Taylor and see if it was successful. The high-tech treatments worked — for awhile (sic). Taylor’s tumor shrunk after initial radiation sessions but started growing again last August. Taylor’s mother Owen made that decision after hours of research on the tumor shrinking abilities of cannabis. They also live in a medical marijuana legal state which makes curing your disease a thousand times easier. I absolutely had concerns about it. This is definitely out-of-the-box thinking, but we didn’t have any other choices,…We knew we would be under a microscope. Everyone had an opinion on what we were doing. But, with all the research I did, I knew it couldn’t hurt her. That’s a serendipitous event for sure since the cost of treatment using cannabis oil is about $1,000-$1,500 per month at least. Perspective needs to be maintained. When comparing it to conventional oncology the cost is closer to one percent of the average cost of chemotherapy, radiation and hospital stay. Marijuana oil, also known as Rick Simpson Oil (RSO), is a flourishing alternative cancer treatment. Research into the science of cannabinoids provides several bona fide mechanisms by which cannabis can actually cause tumors to shrink. Many scientists have reported that THC the psychoactive component of cannabis, and CBD a non-psychoactive cannabinoid found in marijuana, can kill or inhibit the growth of some types of cancer cells, according to the American Cancer Society. Many patients who have “cured” themselves of deadly cancers will testify to the power of whole cannabis preparations such as RSO. It’s very important to a use full-spectrum cannabis oil like RSO. This way you will not miss out on the synergistic “entourage effect,” from all seventy or so phytocannabinoids. Until more research is done unraveling which cannabinoids do what, it’s best to take them all, stoned or not. My article published last month entitled THE REASONS WHY MARIJUANA KILLS CANCER lists five powerful antitumor properties of THC. 2. An antiangiogenic effect. Here THC inhibits the ability of cancer cells to grow new blood vessels. Stop blood vessel formation and you prevent cancers from feeding and oxygenating thus encouraging their demise. 3. Anti-metastatic effect. THC prevents cancers from spreading from the main tumor into other parts of the body. Keeping a primary tumor from metastasizing is of paramount importance in reducing death rates in cancers. The mets are which generally kill the patient by disrupting organ function and starving the patient of vital nutrients. 4. THC has a powerful apoptotic effect. Meaning that THC induces cancer cells to commit suicide. This is a feature of normal cells but malignant cells have lost that ability so they live forever. This effect hastens the death of cancer cells while leaving normal cells untouched. 5. THC stimulates CB receptors on tumors to produce ceramide. Ceramide is a compound that enters cancer cells and inactivates the cell’s energy source the mitochondria. This leads to cell death. Oncologists at St. John Medical Center in Longview did not want to comment. Taylor’s oncologist at Seattle Children’s was unavailable for an interview, but Owen said he didn’t credit marijuana oil for eliminating the tumor. I love the thought of (the marijuana oil) being natural. It really changed my life, but it did give me some trouble…I lost who I was. It’s not an easy treatment. It’s not fun,…It is a very strong medicine, and that’s why it’s medicine. It’s not recreational. Her mom (Karen Owen) relates that Taylor’s last MRI which was done in May, showed no major abnormalities. There was no evidence of any tumor left in Taylor’s brain. Karen Owen: the doctors at Seattle Children’s Hospital don’t want to admit it was cannabis, but I don’t care. She’s cancer-free, it’s more than we could have ever hoped for. Taylor was diagnosed at age 6 with a rare brain tumor that has returned three times. She had two brain surgeries and one proton therapy session. For nine years Taylor has been in and out of hospitals. Each time thinking things were going to improve, but they never were able to cure her or put her into remission. Not until she completed a three-month course of RSO at one gram per day which appears to be the average cancer busting dose once you build up your tolerance to the potent psychotropic effects. I believe the cannabis oil played an important role in her “cure.” Although this brain tumor is not an aggressive malignancy like GBM, it is still a rapidly growing cell type. It is noteworthy that in some cases these tumors may regress into deadly and destructive cell types such as glioblastoma multiforme (GBM). GBM is one of the most aggressive brain tumors in existence. Taylor’s case is another example of why we need clinical trials on human volunteers. Despite modern advancements, colon cancer remains the second most deadly form of cancer in the Western world. In 2008, colon cancer (also known as colorectal cancer or bowel cancer) was diagnosed in over 1 million individuals and was responsible for more than 600,000 deaths worldwide. Our bodies aren’t perfect. Every time a cell reproduces, it makes about 120,000 mistakes in the replication of its DNA, introducing mutations that can lead to uncontrollable division. What we know as cancer. But, if this happens all the time, why don’t we all have cancer? Here’s the answer. We have grown to believe that our home is our castle. But things have changed long ago and nowadays our homes might be hiding more danger than safety. Indeed quite a lot information has been shared about the infamous formaldehyde, nitrobenzene and methylene chloride – all carcinogens that can be found in everyday items such as rubber, plastic, dyes, perfumes, shampoos.